Reflects on the evolution on the awareness on sustainable development from the UN Conference on Human Environment in Stockholm (1972) and the UN Conference on Environment and Development (1992) to the Earth Charter (2000). He emphasizes the interdependence between sustainable developments, the protection of the environment and human rights, asserting the value of the Earth Charter as a guiding document for the Third Millennium. Draws our attention to the need for a new system of values and global responsibility, which reflects the harmony and unity between mankind and nature, in order to ensure human survival for the Third Millennium, and the role of the Earth Charter. Gro Harlem Brundtland's analysis reconstructs the world community's goals on sustainability: from Our Common Future to Making a Difference, explaining the formulation of the inclusion of sustainability in the "health revolution". 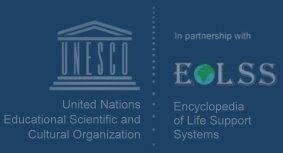 The current life support systems, as proposed by EOLSS, can be achieved by global sustainable development based on human, natural, capital, and technological resources and as a shared project of the different State and non-State actors. Contributes his viewpoint on justice, sustainability and participation as goals for achieving a world society for the present and future generations. Therefore, he proposes to have a declaration of interdependence of the peoples. He also emphasizes the role of the Earth Charter as a people's treaty that will be function as a guide of global ethics-caring for humanity and the Earth, and the role of the Ombudsman Center for Environment and Development. Explains the innovative vision offered by the Earth Charter as a result of a multicultural dialogue and consensus that attempts to meet the challenges facing humanity in the Third Millennium. Additionally, Rockefeller compares this document to the Rio Declaration (1992). Shares his vision of the planet as our country as the first step to survival, and the need for global solutions for our global problems. He connects also 'global neighborhood' with sustainable development and environmental protection. Sheds light on the core of Our Global Neighborhood, showing the need for a civic ethics of common values for guiding governance and the need for United Nations reforms. Shows clearly the interdependence between rights, duties and responsibilities for the global community. His comparison of the Universal Declaration of Human Rights and the UNESCO Declaration of Human Duties of Responsibilities clarifies this concept of interdependence and states his opti mism for the accomplishment of global social justice. Interprets human responsibility for future generations with emphasis on two major goals: nature conservation and equity. Her references to the role of the World Conservation Union that brings together more than 900 environmental institutions, the Ombudsman Center for Environment and Development, and the Challenge of Fontainebleau as a call for action for the different actors complement her contribution.